SkoreIt has been sold to Beezid.com (See what happened to SkoreIt) The following review is for posterity of my favorite all time bidding site, SkoreIt! SkoreIt.com entered the penny auction world in February of 2010. Today they are the most engaging and entertaining penny auction site on the market today. They are also one of the most competitive. This page is the ultimate review of SkoreIt on the web! In addition, we have a growing list of real bidder skoreit ratings and reviews to read through. I fully feel that SkoreIt is legit. I have won multiple auctions since December of 2010 and received each and every one of them. I have also never suspected the site of shill bidding against me in any form or fashion. They are a large, legit penny bidding site seen advertising on ESPN’s Mike & Mike show. SkoreIt! is a penny auction site. They utilize a pay per bid business model and offer new products up for auction starting at one penny. This SkoreIt review will uncover what makes Skore It one of my favorite penny bidding sites on the web. You also get access to my winning Skoreit tips, strategies and ideas that have led me to win thousands of dollars worth of products at SI over the past year. Your Profile Management & Display – 4-10-12 – SkoreIt eliminates profile management. Now all bidders must have their win history on, watching and current bids placed ‘off’. At the time being, there is no more management… you must have a history visible. Your profile includes your previous 28 day wins history, your current bidding status and any auctions you are watching and you can show or hide any of these in your profile. 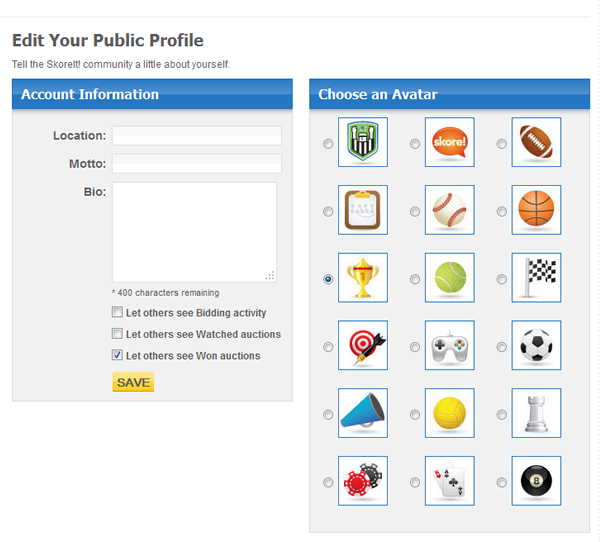 Just click on your name (or on your MySkoreIt tab) and you can manage your profile with the click of a button. You can click any bidders name and you can see which options they show or hide, most importantly is usually the past wins history over 28 days. The Bid-Agent – the feature rich auto-bidder called the bid agent. It is designed not to waste bids and give you multiple auto-bidding options to strategically use. I’ll go over using the different options strategically in the SkoreIt MasterClass. Responsive bidding engine – Not only do clicks seem to go through in real time, the way the bidding engine works lets you decipher what is going on in an auction. You can figure out who the bid agents are, if they are 5 second or ‘anytime’ bid agents and you can find out who the single bidders and the ‘going twice’ bidders are. This is all important strategic information for you to take note of. *I’m obviously talking about having a high speed internet connection… If you are on dial up then… well then take my advice and hold off on the penny auctions for now, I do not think you are quite ready. Your History – if you have strong win(s)s or a lot of wins then turn this portion of your profile it on. If not, turn it off. A strong win is a win for a large amount of bids relatively speaking. Having your profile off is better than on with no wins because someone with their profile off could be strong while someone with no wins showing in their history is most likely not. This feature allows you to create a ‘don’t mess me with reputation’. Currently Bidding On – I do not turn this on but you can publicly show how many bids you have placed so far in an on-going auction if you want. This is generally not recommended as it gives your competition free information, however if you are deeply invested into an auction you can display your history to give off the impression that you are not going to stop. Most everyone leaves this off and only turns it on when they are deep in an auction. Watching – the high stakes bidders use the watch list to inform their competition of their intent to bid on certain auctions. This effectively tells one another this is my turf and back off, kind of the same thing when wolves mark their territory by peeing on the trees, power bidders mark their auctions by watching them and know that their regular competition will likely check to see before planning to bid on an auction. One strategy that is kind of tricky is to watch a bunch of high level auctions, like a bunch of 480 bid packs, so when someone clicks on their history they might just see a bunch of high level items and think that this guy is a power bidder and find another auction with out realizing that you are just watching these items. It might work against newbies but probably causes a target for yourself against aggressive and knowledgeable bidders in that area. These profile features are pretty much exclusive to Skore it and they allow for a higher level of strategic game play than almost any of the other sites. The only other site that I might venture to say that is as competitive and fun to bid on is Beezid.com and that is because you can’t win beezid without massive cojones, oh and without learning the beezid strategies that win. Let’s take a closer look at some of the skore it features and strategic considerations. History – turn on your history if you have wins with highish bid amounts for items, multiple wins or if you have recently won bid packs. If you do not have any wins or if the only win on your history is one where you got lucky with a few bids for a pepper grinder then leave yours off. Also, if you are going after a big item and have won a smaller bid pack it is probably best to leave your history off as the big bidders laugh at those ‘small’ amount of bids. Your Bidder Age – You can not turn this on or off and age is a lessor factor in general. However, if you are a newbie bidding on the same day you signed up you are putting a huge flashing bullseye on your back. Even if you do not plan to bid for a while, it is a good idea to create your account now so it starts getting age to it. You need to spend time researching and watching anyway so go ahead now and get your account going. 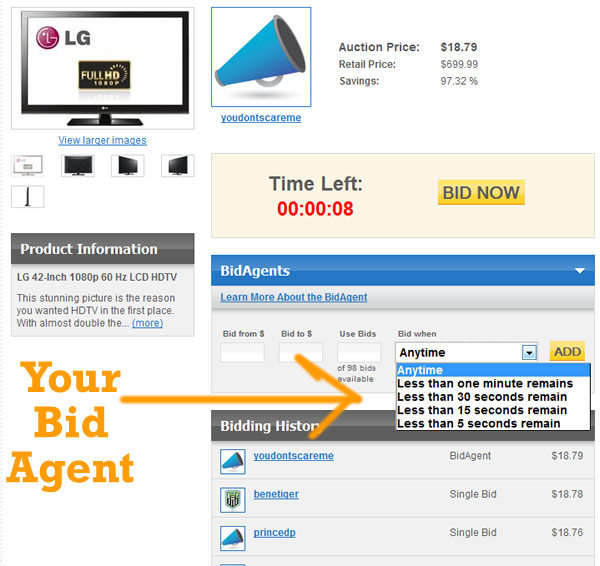 SI’s auto bidding tool is designed to give you control over how you bid and to not waste bids. It bids at specific times instead of just at some random time in the count down timer like the vast majority of penny auction sites. This control over the auto bidder lets you utilize more strategic maneuvering. Lets take a quick look at the bid-agent options and some strategy considerations. You should almost always bid utilizing the bid-agent. Anytime – as soon as anyone bids over you, you bid back against them. 1 minute – an anytime bidder at 1 minute or less. Not used that often. 30 seconds – you anytime bid at 30 seconds or less. 5 seconds – the most used bid-agent is the 5 second bid-agent. Generally speaking you are mostly either using a 5 second bid agent or the anytime option when you are bidding. The most aggressive form of bidding possible is the Anytime BidAgent. Consequently it is also one of the most used. One cool feature of the ‘Anytime’ bidding setting is that it bids slow enough to not bid in between people when they bid right around the same time. This is especially useful when you are being bid against at ‘Going Twice’ by a handful of bidders. When this happens, and it is extremely common to be bid against at going twice, then all of the going twice bidders will have their bids placed one on top of the other in sequence. Then your anytime bid agent will bid again on top of all of them using only 1 bid. Instead of sandwiching your bids in between each one. Also, since each bid takes about a second to fire, if another anytime bid agent joins in, you have enough time to react and change gears if you choose. This is different than the sites like Beezid.com that will instantly zip through auto bids in the blink of an eye. I like to use the five second bid agent when I am against another bid agent and especially when I am against another anytime bid agent. The reason for this is that the anytime bidagent will pick up all the single random bids placed from newbees or other bidders. Sometimes a major battle will break out burning up a bunch of the any time bidders bids and the other single bidder competition while leaving yours in tact at 5 seconds. You can also select what price range you want to begin and end at, however I do not use this as a consideration at all. I simply put my range from $0-$99 and am either bidding or not once I click the ‘add bid agent’ button. Please do not use the auction price as your primary consideration for deciding whether or not to bid, this is one of the biggest penny auction mistakes I see bidders make time after time. The bidding engine on SkoreIt allows for last moment bidding. If you have a strong internet connection and good reflexes and sense of tempo you can find that sweet spot at ‘Going Twice’ and bring the pain….!!! A skilled going twice bidder can stretch out 100 bids to last 5 or 6 to 1 against the aggressive bid agent. SkoreIt Count Down Timer – To be effective at single bidding on skoreit you have to get to know the count down timer. The count down timer at SI works like the following. After “5” it reads ‘Going Once’, then ‘Going Twice’ and finally ‘Sold’. The time between each level of the auction closing is just around a two second tempo each. The timer counts down with the following: ”7, 6, 5, Going Once, Going Twice, Sold’. Going once takes 2 seconds, going twice takes 2 seconds and ‘Sold’ occurs somewhere in the first part of the fifth second. There is a tempo and rhythm that I keep up with by tapping my foot. I have to tap twice for each of the ‘going’ phases and “Sold” happens when I tap my foot the fifth time, or really soon there after. Study the count down clock and learn the tempo. It’s good for seeing how close you are to winning and so you can gauge when you have to place your last second bids if you decide to play defense (being a last moment bidder). Intial “Tag Battle” – if you are bidding in the high end auctions you should be aware of tag battling, most likely at least. This is the initially skirmish by bidders to establish who is going to be the ‘count down bidder’ that happens shortly after the auction is listed open. These battles are usually smaller in comparison to getting involved in an auction that is underway and these are not as common or practiced in the medium and smaller auctions. Count Down – this is the period where the auction counts down to beneath the timer ceiling. The timer ceiling means that the timer can not go back above a certain number of seconds. On SkoreIt, these have ranged over time from as little as 7 seconds to 30 seconds. During the count down phase, we will usually see an anytime bidagent at the top of the heap until the auction reaches beneath the timer ceiling. After this ceiling is hit, the auction battle begins. Auction Battle – this is when the dueling begins and the battling to be the top bidder really gets into full effect. Usually it means anytime bid agents fighting other bid agents and other single bidders. Depending on how the auction battle is going will help you determine whether or not conditions are favorable or not to bid. I will get more into favorable and unfavorable conditions in the in depth skore it masterclass. Attaining Victory – Being the top bidder when the auction announces ‘SOLD’! You have to win the auction battle to attain victory. You are near attaining victory when you are the only bid agent on an auction and are only battling single bidders and going twice bidders. Skoreit offers a few types of auctions and each has their own strategic considerations. OT vs “Non-OT” Auctions – Buy It Now vs No Buy It Now – it is important to understand the difference between an OT auction and a non-ot auction. OT stands for ‘OverTime’ which really just means they offer a buy it now feature on this auction. You can read more about buy it now penny auctions but the short answer is that bidders can apply the value of the bids they placed in an losing effort towards purchasing the item out right. This effectively takes away their risk. Auctions with OT in general, have less risk, less reward. Non-OT auctions mean that any bids placed by anyone except the winner have lost the bid and the money that the bid was worth with no way to regain that value. One thing to watch out for with the OT auctions is that you are comfortable paying the retail price for that item. AAA Auctions – This means no bid agent auctions, or ‘All Action Auctions’. Less barrier for entry for most bidders. I’ve written strategy on skoreit AAA auctions already but just know that these auctions are more likely to draw a handful of casual bidders so you need to prepare to establish dominance as the aggressor by not letting anyone get to going once. Sports equipment – from golf clubs to collectables. Electronics – tv’s, laptops, netbooks, PS3’s, Xbox etc. House hold stuff – Knives, glasses, safes, pepper grinders. Precious Metals – 1oz silver coins and bars, 1g to 1/4oz gold bars and coins. Gift cards – from $10 to $1000 although the $1000 auctions are not common anymore. The shipping in general is speedy. I usually receive items within 5 days of completing the purchase, give or take a few days either way. Pricing is average to above average. Some small things like if you win two items in an auction even though they are shipped in the same box, you get hit with two shipping charges. We have decided to keep all bidder ratings at our companion site, BestPennyAuctions.net. You can see how others have rated skoreit and read comments about this penny auction site. If you are a bidder there we encourage you to leave your comment and ratings there as well. Are you new to Penny Auctions and just learning about SkoreIt? May I suggest starting out on a site like QuiBids.com that offers 100% of your auctions with a buy it now option and is more of a shopping destination than a competitive battle for bargains or look at our full list of penny auction reviews or our top lists of penny auction sites. However, if you are somewhat experienced in the world of penny auctions and are looking for a way to take your game to the next level, sign up for my 100% free guide to crushing SkoreIt.com! I call the “SkoreIt MasterClass”. It is free but I only want to share the strategies with people who really want and will put the information to use so you have to enter your name and email address below. Do not worry, we do not spam and you can unsubscribe with the click of the mouse at any time (but you will not want to). *SkoreIt bans 30+ of their top powerbidders. Ugly. Win BIG on SkoreIt! 100% No spam guaranteed! Just enter your name and email in the form above and check your inbox for my 100% free tips that win! I have been a avid bidder for over 10 years. I started at Quibids, have accounts with both Beezid and Happybidday. I have frankly seen the PA sites all become the same over priced bids with terrible product reviews. Bidding these days has lost its fun and win factors. Each site just becomes more costly i would rather just buy what I need. As for Happybidday they are the only site i have ever contacted Pay pal and my bank and demanded a refund. I was disgusted with there horrible products no decent customer service. And it is easy to check the prices set by all of them on the item up for auction i can usually find it priced lower and better at Amazon. It’s no longer penny auctions its pay a fortune just to hopefully get a decent gift card. Even the most seasoned bidders i think are getting sick and tired of them all. spent 75 dollars and got nothing i wont do it again. SkoreIt can work if you do research and avoid the power bidders. Do not bid until you figure out who is not going to stop with their bids. Power bidders will bid over retail to win. Do not bid against power bidders. Once you figure out to avoid the power bidders, winning is easy. Skore It is only for bidders with deep pockets! I gave a good run on my 240 bids @ $150 on 3 auctions and did not win even 1 auction. However I made sure when I gave up, my opponent would be in the hole/red. I was going to make sure they made no headway/profit. If I was not going to win then neither were they even if they won the auction. I have love/hate feelings for Skoreit. It is impossible to win, but at the same time unlike Beezid or happybidday, the auctions are over with and not a prolonged hour after hour after hour after hour of bidding torture. I just want it over and done with, and Skoreit definitely delivers on that aspect. As with any auction site SkoreIt needs to try and even the playing field, And I wish they would keep in mind that there are actually people that live somewhere besides the East coast time zone that would like to participate in some worthwhile auctions after dinner in the Pacific time zone. And I think if they limited bidding to the actual value of an item it would go a long way to help keep things fair. Qubids does this, but lately they too have started auctioning so many bid packs it has kind of made that limit useless, auctioned bids do not apply to the actual value limit, they have reallly taken a step backwards as of late. Take your time. Enjoy your win for a while. Only 12 wins a month allowed. Watch bid histories and take the advise of Auction Junkie and choose your battles wisely. In my opinion best penny auction site. Only things they could improve on is more free bids via email. And shipping costs. Response to other emails, ya we all want to win but its also the excitement and the strategy involved that makes us keep hitting that BID NOW button. My favorite of all sites. More free bids via email would be nice. Tough to win big ticket items but can be done. Remember we all want to win but its also the challenge and excitement that makes us HIT the “BID NOW” button. For an example, at 60 cents per bid, how can some people keep on bidding like 234 times (that would come to $150.39 including $9.99 shipping cost if they win) on a $75.99 item plus tax if applicable? SkoreIt needs to put a cap on bidders going past what is worth of the item that is up for auction. You have to see how much shipping would be if you win the item … a pair of oven mitts is $10.99 shipping! A winning pair of earrings to ship out is $9.99! I used to play on SkoreIt but gave up when I realized you would lose a lot of money to win an auction. You are better off going on a web site like Walmart (to name an example) and place an order of the item or similar item that would be or is up for grabs on SkoreIt. Save your money! This site is competitve, needs more auctiuons. If you are not stack with bids, diffcult to win.Auctions spikes when commercials run.Well run. I agree with some of the negative comments that have already been posted. It is almost impossilbe to win the valuable auctions. I have questioned customer service about a lot of bidders not displaying their profile. I do not believe this should be permitted. I also do not understand how some winners are not charged for their bids after they win the auctions. Customer service could not explain to me (that I was able to understand) how they place mega bids and when you check the winners they are not charged for all of their bids. Here a few examples: Auction 229822, the winner used 373 bids – was charged $1.88???? Auction 222807 – winner used 530 bids and was charge $0.71???? auction 226978 winner used 2048 bids and was only charged $6.65???? Auction 233094 – bidder used 504 bids and was only charged $2.84??? Something is really wrong here. wow. live biinddg? i wonder if a lot ppl there bid for the gadget? and did the price go over the market price? SkoreIt.com is a great auction sites. I highly recommend you give it a try. Much fun, but must work hard to win. Skoreit is a great site. 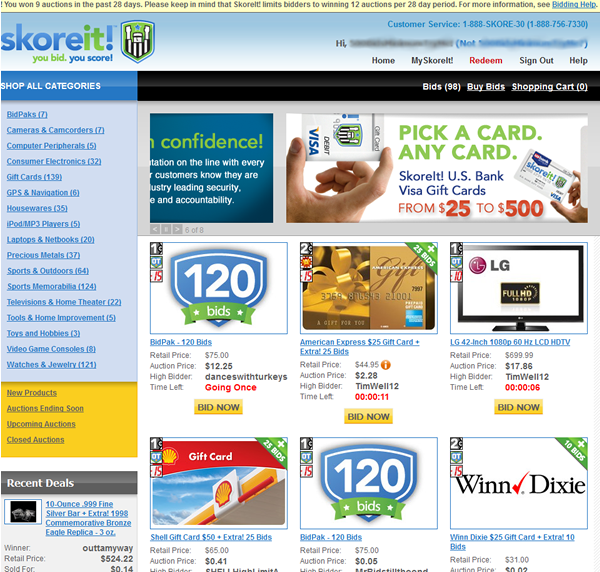 Skoreit seems to have fewer competitors compared to sites like Quibids or DealDash. The ease in use of the tools for bidding great. The prices of the bid packs are reasonable. I was skeptical about the penny auctions prior to researching it more. Fortunately, I came across the Auction Junkie and have been able to not just bid on items, but use strategy as well! I have found Skoreit to be a top-notch site from its visual appearance to the customer service. On a number of occasions I have contacted Skoreit’s customer service number and within five seconds you are actually talking with a real-live-person (unusual these days). Something I really like about Skoreit that I have not seemed to find in other penny auctions (happybidday) is that for the most part, each bid used is around 60 cents. I was not a fan of all the promotions that happybidday gives, because you are left clueless as to the possibility of the number of bids someone can actually use toward an item. In a nut shell, Skoreit has gotten my respect through their great customer service, no-gimmick auctions, and most importantly, the ability to use strategy through Bid-Agents and reviewing other people’s histories. I love and enjoy SkoreIt. Lots of fun and excitement for things I actually need, not just wants. Problem is trying to bid against greedy people. I would like to win sometimes and the same ones win all of the time. There should be limits to some of the same ones popping up so some of us can have a little fun too!!! i love skoreit. the prizes are great ad they are definitely things i want. if i can bid and get them that is so sweet. i look forward to my time spent there and it is so much fun. Bids are on the expensive side but some good choices. skore it has too many bidders. I seen the advertisement on ESPN which is great but. When your trying to win such as 240 big packs there is 50 people bidding on the same item. If I would bid here again I would only bid on BIN items which you could trade your bids to buy since these items also goes very high. the customer service don’t reply to my emails as well. I echo the sentiment of too many power bidders and not enough auctions. Also, more variety in gift cards and different playing levels would be nice. Customer service is always helpful, professional and very nice to deal with. Too many power bidders who claim everything – if they stopped auctioning bid packs and put extra bids in with wins then the playing field would be even and more people would have a chance. Even though I won a few auctions it’s hard to bid against the power pidders. The big items usually all of them go to the same power bidders. There should be some kind of a cap on them. That’s the most frustrating part for me. Gift cards are great but again the $500 we know who gets’s those again. Would play more often if they would offer some special bid packs. Also more auctions without waiting would be great. Customer service is great. Merchandise is good quality. This is a hard website to win unless you have a stockpile of bids. The few items I have won have shipped quickly and I’ve never had any problems with the website. Because there are so many power bidders it would be helpful if they had different categories for beginner bidders. Especially for bidpacks. I agree that they need more auctions. They have grown in size but have the same number of auctions. Good to see they got rid of the 480 bid packs as these were only won by the power bidders, then used to monopolize the large value items. I lost a lot of money on the site while learning how it worked. Now that i somewhat understand the site, i am winning on a regular basis. All in all a good fun site. Very frustrating at times. Could have more auctions going on at one time. There really needs to be more auctions going at one time to make the site more enjoyable instead of everyone waiting for an auction. Skore It and Qui Bids are the best. My personal favorite site to bid on. I love that you can click on bidders names and get a bunch of information about your competition. I also love how the bid-agent works, unlike sites like Quibids that randomly place the auto bid, SkoreIt’s auto bidder works in a way where everyone can figure out what is going on and who is bidding how. I trust the site itself not to cheat against me, however I’m sure bidders cheat some times (like anywhere). SI could be a bit more pro-active in hunting down collusion and making it so there are only LEGIT accounts getting the 16 free bids for signing up. Other than that, I love bidding on SkoreIt!